Her is a bit of digital restoration work I did on a photo of the monument. 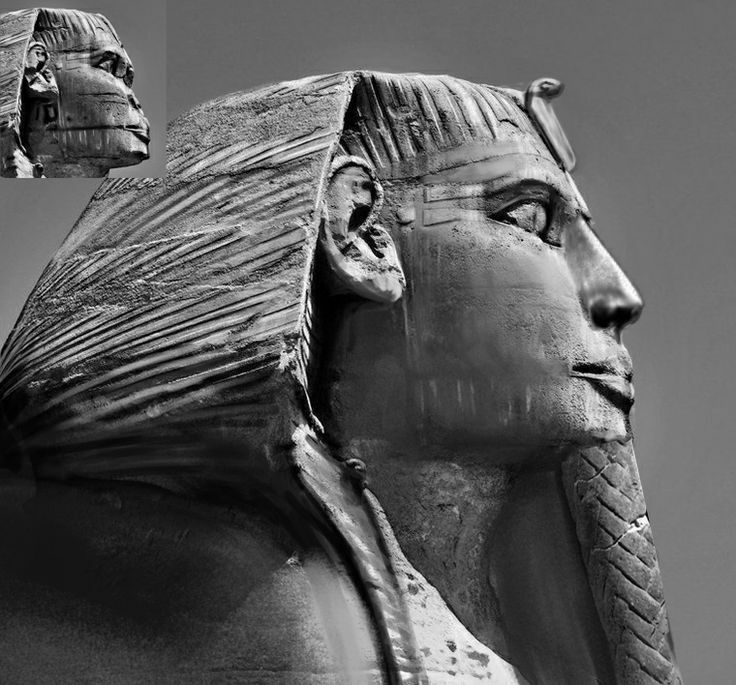 The nose is taken from the intact statue of Chephren/Khafre, from the Valley Temple presumed builder of the Sphinx. (I presumed so until yesterday, anyway, when I heard about the Inventory Stela which names Khufu as a restorer of the Sphinx, and the tenuous nature of the evidence linking the Sphinx to Khafre). You know this looks to me like Tuthmosis IV's mummy, which is interesting because it does seem like he worked on the sphinx a bit more than just removing the sand. For example he added the stele, beard and probably a statue of himself. Is it possible he re-modelled the face as well? Nice work. But the nose and the beard plus the uraeus gives him a completely different persona. I think that your use of the nose from the Khafre statue is justified given that the only known intact image of Khufu is the little ivory found by Petrie. The two kings were after all closely related. The beard is a bit more contentious. To my uneducated eye, the cross hatching, representing plaiting I suppose, does look to be a New Kingdom style. My limited research seems to show Old Kingdom beards had a series of horizontal lines instead of the cross hatching. Perhaps pleats rather than plaiting? All this from a rank amateur of course. Corrections would be welcome. All the same,a great reconstruction and an admirable skill in photo manipulation. As we have part of the Sphinx's beard in the British Museum, I would say the plaiting is correct, but then again, they are absolutely sure this beard was a New Kingdom addition, as the original Sphinx carving did not have a beard at any time. they are absolutely sure this beard was a New Kingdom addition, as the original Sphinx carving did not have a beard at any time.. There is a relief of Akhenaten as a Sphinx at the Museum of Fine Arts in Boston. Its unlikely that it happened but I can imagine how *** the ancient egyptians would have been if Akhenaten would have placed his face on the Sphinx back in his days. I can imagine them staring at the thing like "Oh you've really gone and done it now...". And then another pharaoh changes the face back and glues a beard to the new face.